Hi all! How are you guys doing today? I’ll be flying out to Indonesia soon and I’d like to apologize first if there won’t be any tutorial for the next couple days. I will still continue with my blog, and I will try my best to update it as regularly as possible. I’ll let you guys know how it is once I’ve settled down in Jakarta. Today’s tutorial is just a quick base how-to. Whenever I’m doing foundation/primer, I called this as a “base”. Just like a painter who needs to prepare his canvas before painting, I prepared my base to make it as flawless as possible before any makeup application. This is just a quick how-to to show you how easy it is to achieve a good base. Your fingers are your best tools if you are applying this to yourself. If you want your base to look like your skin, then I do suggest strongly to apply your base using your fingers or a damped sponge, esp. if you’re a beginner. A brush might picked up too much product if you are not careful. I do tend to apply my base using my fingers on myself. On my clients, I used different brushes (foundation, kabuki, angled etc) or sponges. This is quick and easy if you need to get ready in a few minutes. 1. Prime your face (if needed) – if you have an oily/combination skin, I suggest priming your face after moisturizer. Primer will keep your foundation from breaking (or melting). A little primer goes a long way! I like using Estee Lauder Idealist Even Skintone Illuminator. My faves also include: NARS Pro-Prime, Smashbox Foundation Primer and L’oreal Magic Lumi. 2. Foundation – I prefer liquid/cream foundation since it blends to the skin seamlessly if you choose the right product. In this tutorial, I chose the new L’oreal Lumi Magique foundation in W4. I applied it to the center of my face and blend it outwards using my fingers. You can use foundation brush or a damped sponge. Layer the foundation thinly to achieve that dewy look and avoid a cake-on look. Again, a little goes a long way! My faves include L’oreal Tru Match, NARS Sheer Glow, Chanel Teint Innocence, Lancome Teint Miracle and Chanel Aqua Vitalumiere. 3. 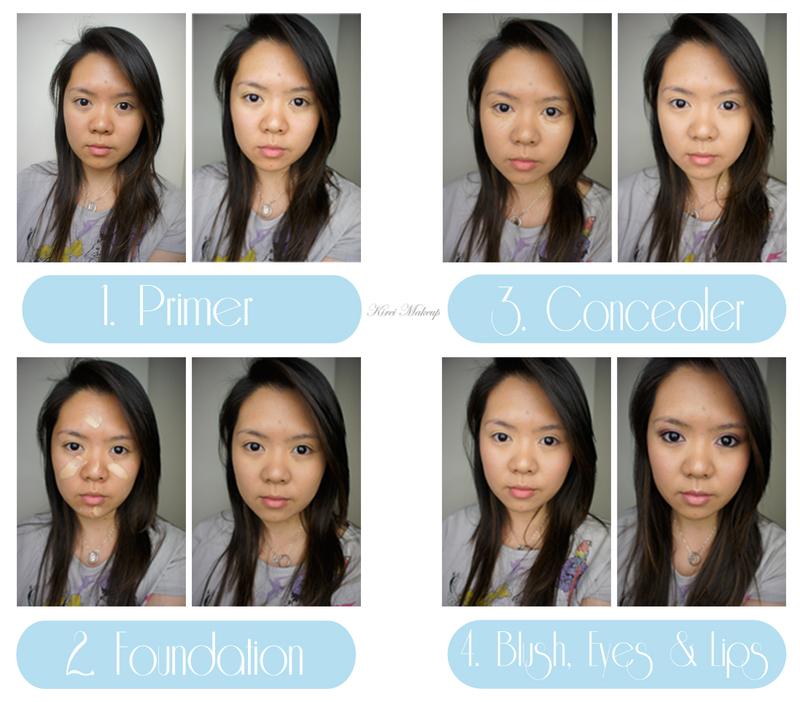 Concealer – THIN layer is the key for concealing. To cancel out under eye circles, I tend to look for a warm undertone concealer (yellow/orange/salmon). A trick I learnt in my Film & TV class is to use a warm concealer instead of those that are lighter. I also prefer a warmer concealer under the eyes. I’ve seen girls using concealer that are too light under their eyes and they ended up looking like a racoon in pictures (with flash on). I think this is a trick that is also used by Scott Barnes in his book. For blemishes, look for a yellow-based concealer to cancel any redness. I, personally, match the concealer for blemishes to the foundation and skin so that the texture/bumps can look a little bit more flattened. Remember that lighter concealer will highlight the bumps even more. I’m using L’oreal Touche Magique concealer pen. 4. Blush, Eyes and Lips – Applying blush in different location on your cheeks can affect the way you look. If you apply it on the apples, it might look a bit droopy for most people. I tend to apply in a bit higher, on the cheekbones itself. I love cream blushes! They blend seamlessly to the skin. I am using Maybelline Dream Bouncy Blush in Pink Plum for the tutorial. Yes, I do apply highlighter and bronzer/contour if I go to parties or do tutorials, but if it is just daily makeup, I tend to skip it. Less is more! Let your skin shine through.